Are you all ready for the big Turkey Day tomorrow? Well, once it's over and your fridge is busting at the seams from all the leftovers, you will need this post. The picture at left (from the Food Network) is of one of Rachael Ray's Thanksgiving leftovers recipes. 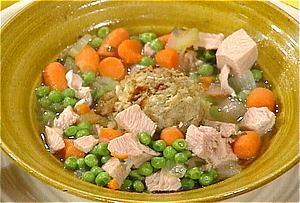 This is the one I made last year and we loved it - Turkey and Stuffin' Soup. I know it sounds weird, but it was a great way to get rid of the leftovers and didn't involve a sandwich (which is what we had for lunch). Plus, it's super easy for someone who is pooped from making a huge dinner the day before. I don't know what it is about that soup, but I can't bring myself to try to make it or even attempt to eat it. I think it's the thought of stuffing in my soup. Blech! Jennifer - I know it sounds weird, but it is soo good. It's kinda like a chicken and dumpling soup. I am a picky eater, too. I pretty much hate all condiments - mayo, mustard, pickles, relish, ketchup. And I don't really like chocolate either. I am nuts.